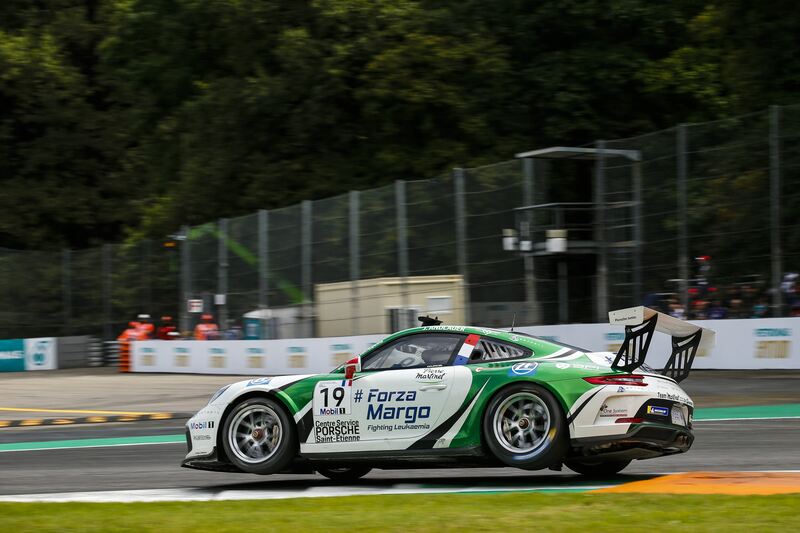 The 8th round of the Porsche Mobil 1 Supercup was run at the ultra fast Monza track in Italy. 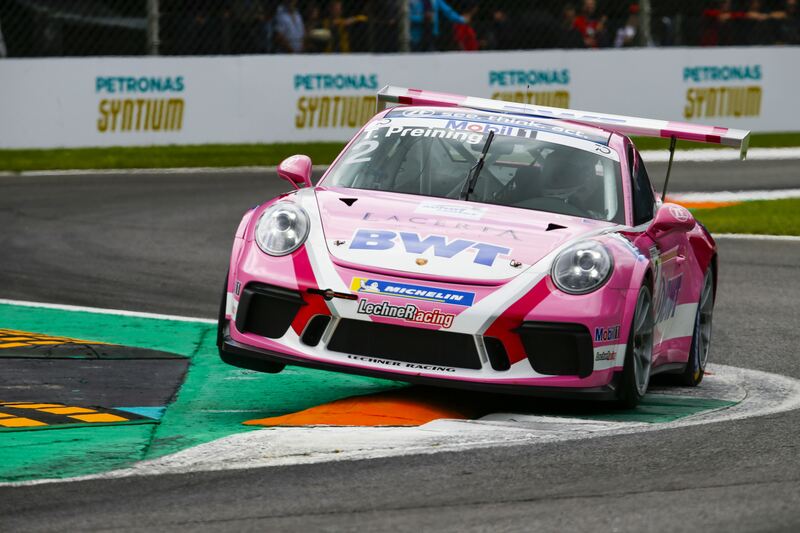 Championship leader Michael Ammermüller had grabbed Pole Position ahead of his teammate Thomas Preining, local hero Mattia Drudi, Zaid Ashkanani and number two in the Championship, Nick Yelloly. Ammermüller made the best getaway, but was challenged by Preining towards the first chicane. The two drivers were almost bumping each other through the chicane, but Ammermüller had to drop to P2. Zaid Ashkanani, Dylan Pereira and Florian Latorre all had to take the escape route through the second chicane on the first lap of the race. Danish driver Mikkel Overgaard Pedersen had qualified 9th, but was quickly up to P7, before he dived past Jaap van Lagen in the Parabolica corner, going on to put ten Voorde under intense pressure. Pedersen had to take the escape route in the second chicane, but was able to blend in on P6. Preining, Ammermüller, Drudi and Yelloly drove in one long train out front. It appeared that Preining was marginally slower than the others, but not by a lot. Ammermüller was kicking up a bit of gravel on the lap 7, but not enough to lose any positions. 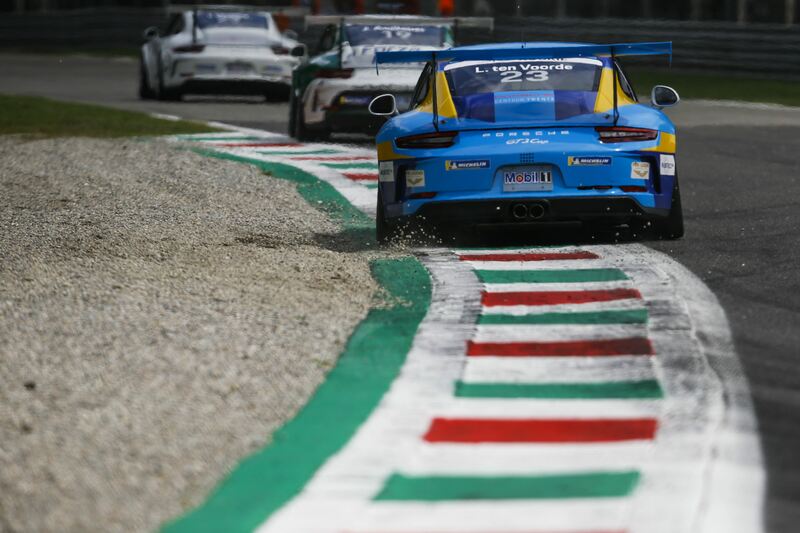 Ashkanani tried to overtake Pedersen round the outside in Parabolica, but the young driver from Kuwait ended up running through the gravel, and lost several positions. Pedersen unfortunately made a small mistake during braking for the second chicane, and once again had to take the alternative route back on track. This time he lost three places, but quickly gained one back by overtaking Jaap van Lagen once again. Josh Webster and Al Faisal Al Zubair had a bit of a rub through the second chicane, sending the latter onto two wheels, when he hit the tall curb. Zaid Ashkanani tried to use that episode to his own good, but didn’t make it past. Dylan Pereira got a huge tow down the start-finish line, and made it past Larry ten Voorde down the straight. Norwegian driver Marius Nakken had to park his car, when he punctured on his left rear wheel at top speed. Fortunately he was able slow the car down without hitting the armco. Van Lagen gained more speed three laps before the end of the race, putting Pedersen under a lot of pressure, trying to pass both on the inside and the outside. Larry ten Voorde punctured on the back straight during braking. Mikkel Overgaard Pedersen punctured on the penultimate lap. A great shame for the Dane after another incredible performance, losing out on the points. Josh Webster got a puncture on the start of the very final lap, just like Nicolas Misslin also had to retire with a puncture. Gustav Malja punctured on the back straight, while Zaid Ashkanani did exactly the same, going into the very final turn. All punctures was on the left rear wheel, so it didn’t look well from Michelin’s point of view, with that many punctures. Julien Andlauer finished the race in 8th, after starting dead last. Impressive race and 23 overtakes, of course helped by the punctures too. Thomas Preining won the race ahead of Michael Ammermüller and the local favourite, Mattia Drudi. Nick Yelloly finished 4th, making Ammermüller extend his Championship lead to Yelloly. Preining consolidated his third position ahead of Andlauer, after his recovery drive. 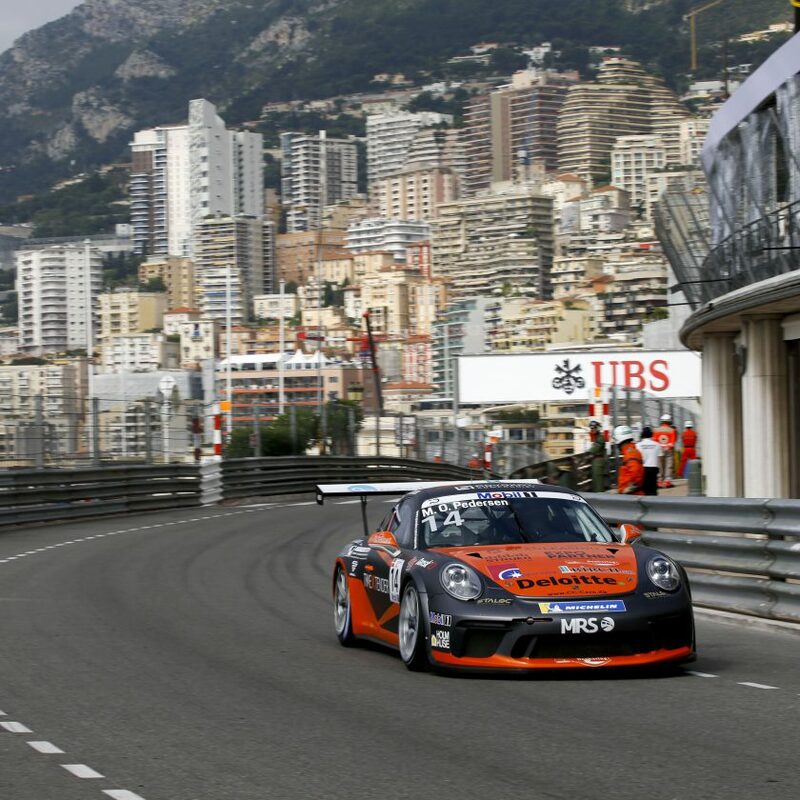 This was the third victory in a row, in an amazing second half of the season for the Porsche Junior driver. Now the teams have almost two months break, before they will race in Mexico on 26 to 28 October, with both a Saturday and Sunday race to be run, which will decide the Championship.